Free Shooter is lightweight, easy-to-use tool for taking screenshots. This simple program supports 3 capture modes: full screen, active window and selected region along with 5 output file formats: BMP, GIF, JPEG, PNG and TIFF. Other features include copying image to clipboard, capture sound, mouse cursor inclusion, clear window transparency, disable aero effect, customizable shortcut keys, always on top, tray control, multi-monitor support and more. A 64-bit version is available (included in archive). How to extract: Download the ZIP package and extract to a folder of your choice. 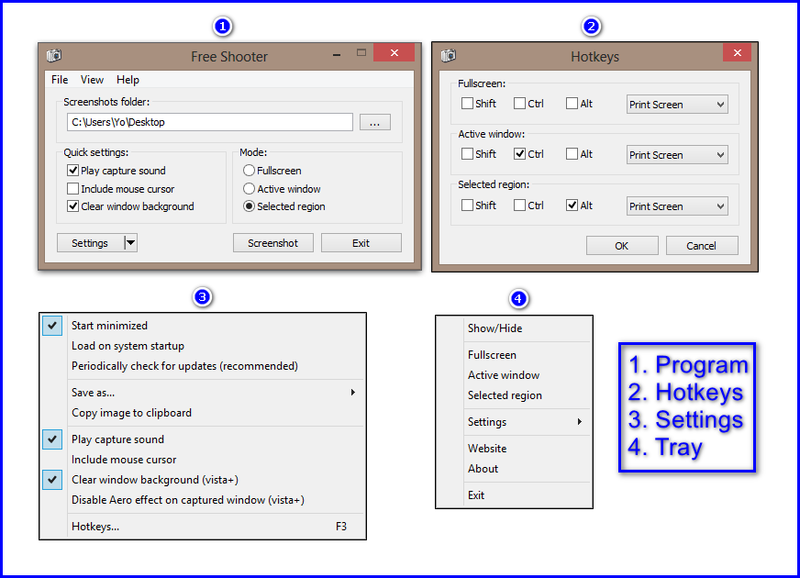 Launch freeshooter.exe from 32 or 64 folder (for 64-bit OS). Region selection mask device context. Nice to have an actively developed screenshot tool that doesn't rely on dotNET libraries.